Figure 1. Taxidiotisoma portabile sp. n., male ex NMV K-12071. A Habitus B dorsal views of midbody rings C lateral views of midbody rings; anterior to right D Lateral views of head. Scale bars: 2.5 mm (A); 1 mm (B, C); 0.5 mm (D). Taxidiotisoma portabile gen. n., sp. n. is described from scattered populations in New South Wales, Victoria and Tasmania, Australia. Populations of T. portabile in Victoria, Tasmania and parts of New South Wales occur in urban, suburban and agricultural areas, with no collections of the species in natural habitats in the same district. Taxidiotisoma portabile is likely to be a native exotic species whose home range is in eastern New South Wales. Genus Taxidiotisoma Mesibov & Car, gen. n.
Type species: Taxidiotisoma portabile Mesibov & Car, sp. n., by present designation. Diagnosis: In gonopod structure, Taxidiotisoma gen. n. is closest to Antichiropus Attems, 1911, Australodesmus Chamberlin, 1920, Pogonosternum Jeekel, 1965 and Pseudostrongylosoma Verhoeff, 1924 in the Australian paradoxosomatid fauna (see Remarks). Differs from Antichiropus in lacking a process on the lateral surface of the femorite, from Pogonosternum in having the distal portion of the acropodite divided into two rather than three branches, from Pseudostrongylosoma in having a divided solenomere, and from Australodesmus in having a Y-shaped solenomere rather than a flagellum-and-sheath solenomere. Name: Greek taxidiotis, “traveller” + soma, Greek “body’, often used as an ending for generic names in Paradoxosomatidae; neuter gender. Latin portabilis, “portable”, adjective. This species is almost certainly being transported to new areas in Australia by cars or trucks. Remarks: We do not know whether the eight “outlying” New South Wales, Tasmanian and Victorian samples (Fig. 5) represent long-established populations or ephemeral colonies, but the broad scattering of records suggests that this species will be found elsewhere in Australia in coming years. Robert Mesibov and Catherine A. Car. 2015. 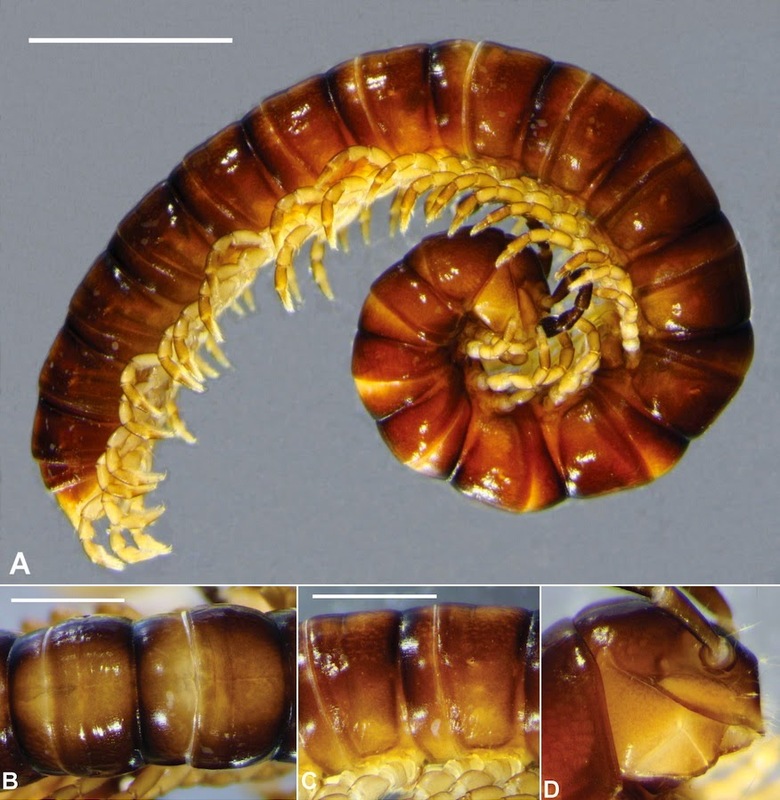 A New Genus and Species of Native exotic Millipede in Australia (Diplopoda, Polydesmida, Paradoxosomatidae).